The effect of the Southern California drought has changed my neighborhood. The vast flower gardens that once flourished and were fodder for my floral paintings have become more sparse. The dry weather, plus local water restrictions, dictate more drought-resistant landscapes of packed dirt, stone or turf. It is logical that these changes will gradually begin to alter the local ecosystem. If flowers vanish, then the creatures that flourish from their nectar will also transition. 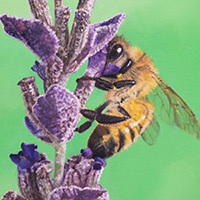 These observations inspired the painting; “Lavender Candy.” The purple stalks of lavender flowers in my front yard are buzzing with bees during spring and summer. Watching these fantastic yellow and black floating creatures make me sentimental about their continued presence as the landscape changes. Amongst the most important insects on earth, their pollination beautifies and contributes to floral growth. The growth of florals, in turn, creates habitats for other animals such as hummingbirds. My painting not only depicts the beauty of the relationship between flowers and bees but is also a homage to their importance in our environment.